Light makes all the difference! Are you already planning the renovations and decoration that you will add to your garden next summer? Have you thought about light that you will add to your decor? Light have an important role in the decoration, both inside and outside the house. And since we live in a country with four seasons, we want to make the most of our summer season. Would you like to enjoy your summer evenings? So do not neglect the choice of lighting. Will you opt for practical lighting or lights to decorate? These 20 ideas can help you see things more clearly. 1) By making a kind of little "roof" with a transparent panel on the top, you will be able to add curtains on the sides. You can also add nice fairy lights and candles for late night dining outside. 2) You can add tealights or fairy lights into glass jars, this is beautiful! 3) You can hang lanterns or add candles to decorative hooks. 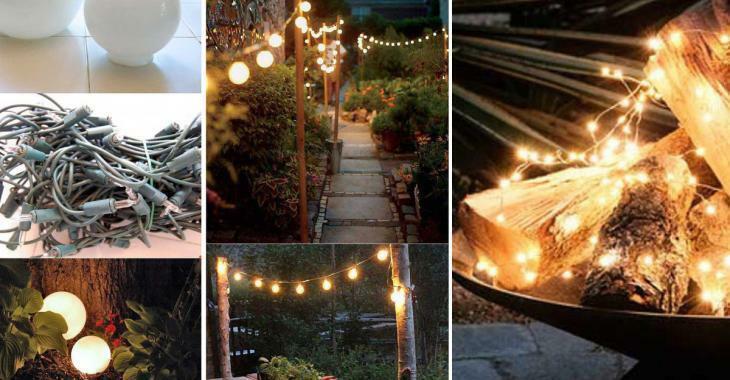 4) The light garlands are very popular in the last few years and they bring a nice touch to your garden. 5) To create a warm atmosphere, add floating candles and freshly cut flowers in a bucket filled with water. 6) You can wrap tree trunks with white light garlands ! 7) Add lights under the benches to light an entire terrace. 8) Use hooks to hang Mason jars or colored pots and add nice candles inside. 9) Pour concrete into buckets to hold tree trunks. They will be used to hold the light garlands. 10) Add fairy lights to create a faux fire pit. 11) Succulent plants grow anywhere, as long as there is a minimum of soil. They don't need too much water water and love the sun. Create a beautiful decoration with candles in a bucket with beautiful stones and some green moss. 12) Add volcanic stones into a flower pot to make a small fire pit. 13) Choose the exact location of your solar lights to create a perfect atmosphere. 14) Get ancient globes lights that were in the vestibules or staircases of houses in the 70s. Add white light garlands to decorate the garden. 15) Collect bottles of all colors to make lampshades. 16) Use wire to hang glass jars and add nice candles inside. 17) Light the lawn, illuminate the stone, light the gravel so that we can see all the details of your garden. 18) Collect glass jars and use them differently. 19) The glass blocks of the 80's will be beautiful in your garden.